Message in a Bottle – Shazam! This weekend I was spending the day wandering around the city on my bicycle. I started out by riding to the DART station with the intention of getting on the first train and riding it until I felt like getting off. As can happen on days like that, later in the afternoon I found my self wanting to take a little rest. 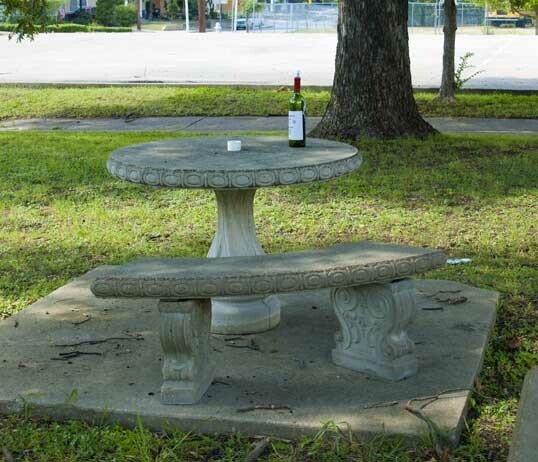 I was riding through Oak Cliff, a little west and a little south of the Bishop Arts District, and spotted a tiny bit of shade graced by a collection of round concrete picnic tables with benches next to a Christian School. It looked inviting – to sit, polish off a water bottle and listen to some music on headphones. So I swerved off the street and rode the sidewalk under the trees. The only thing that was there was a wine bottle sticking up on one of the tables. I assumed someone had been there before me – probably the night before – and used the spot for a little public intoxication. Not liking litter – I went over to fetch the bottle so I could find a trash can somewhere. As I approached the bottle I realized I was wrong. It wasn’t a cheap empty. Someone had replaced the label with a handwritten sign that said “Message In A Bottle,” with a lightning bolt and a couple of stars. There was a missive wadded up in the neck of the bottle. It was wet and torn, but I extracted it and carefully unfolded it on the concrete top of the picnic table. 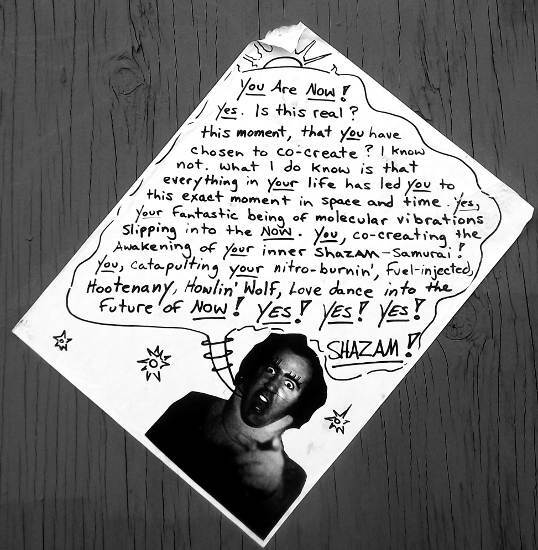 The message was a Xeroxed mysterious crazy rant ending with Shazam! and a crude picture of Andy Kaufman. 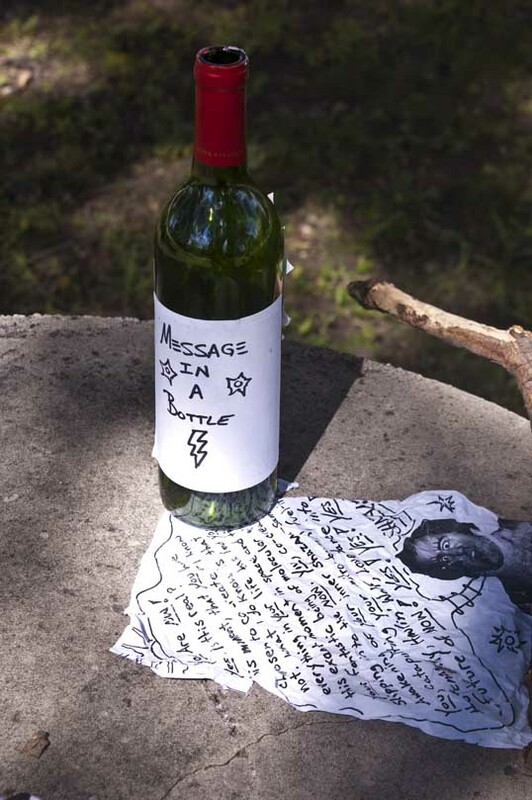 The message bottle on the shady picnic table. You are Now! Yes. Is this real? This moment, that you have chosen to co-create? I know not. What I do know is that everything in your life has led you to this exact moment in space and time. Yes your fantastic being of molecular vibrations slipping into the NOW. You, co-creating the awakening of your inner Shazam-Samurai! You, catapulting your nitro-burnin’, fuel-injected, Hootenany, Howlin’ Wolf, Love dance into the future of NOW! Yes! Yes! Yes! Now, what was so odd about all this is that I had seen that exact same message before. I had photographed it and written a blog entry. Over a year ago, I came across another exact copy of this glued to a boarded-up window in Deep Ellum. I wrote about it here: Text on the Streets. So there is someone that for at least over a year has been going around Dallas putting out these little nutjob manifestos. I found two about six miles apart. I did a search on the text and found nothing (other than my own blog entry). I carefully folded and rolled the worn paper and stuck it back in the bottle. Now I want to keep my eyes open – see if I find it again. This entry was posted in Daily Epiphany and tagged cycling, Dallas, message, Photography, shazam, strange, street photography. Bookmark the permalink. May be someone is able to anticipate your every move and posted those two missives for you to find? Which you did. Very interesting! wow that is really weird. it’s amazing how something like that can travel around. I’m intrigued now! I hope you track down the source or the meaning.